The “Pre-Carbo-Load-Marathon-Dinner” in Boston has become an integral part of the total Boston Marathon experience. 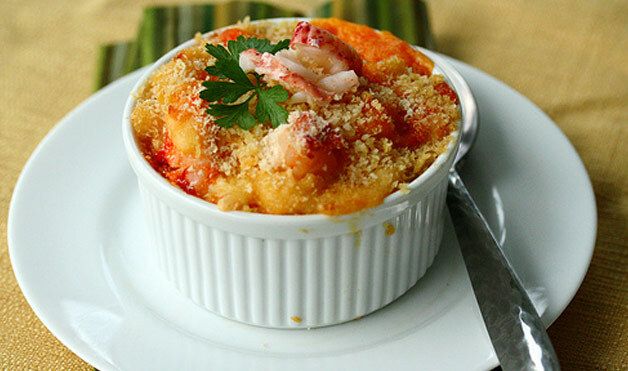 This year Burtons Grill Culinary Director, Denise Baron offers up a recipe for New England style Carbo-loading at home with her famed Lobster Mac n’ Cheese! 1. Bring water to a boil. Add salt. 4. Cook Pasta for 13 minutes. 5. Pour pasta into colander and shock with cold water until cool. 6. Allow 5 min. to drain and dry. 7. Mix cheese sauce and cream into pasta. Season mix with salt, pepper and cayenne. 9. Top with shredded cheddar, bacon pieces and crushed crouton. 10. Place in 400° for 15-30 minutes. The macaroni should be golden brown and bubbling. 1. Melt butter in small saucepan, add onion and cook slowly for 3 to 4 minutes or until onion is translucent. 2. Sprinkle in the flour and cook for about 3 min. making sure the roux doesn't color or burn. 3. Whisking constantly, add the milk and cream and whisk until fully incorporated. 5. Maintain a gentle simmer, and cook, stirring occasionally for 30 min. 6. Remove sauce from heat and add seasonings. 7. Strain sauce then add pecorino and reggiano, stir to incorporate. 8. Cool sauce completely in ice bath. Click (here) to visit the Burtons Grill website. 1 Response to "Burtons Grill Lobster Mac and Cheese"
You know where else has an awesome Mac and Cheese?